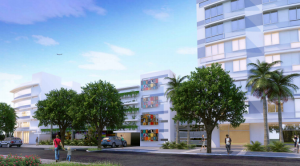 A major mixed-use project that would include an assisted living facility, workforce apartments and retail space is planned for North Miami, The Real Deal has learned. Markus Frankel, president of Bay Harbor Islands-based Frankel Benayoun Architects, presented the mixed-use development proposal to a small, but engaged, community gathering in North Miami earlier this week. The development, which will be located at 950 Northeast 124thStreet, if approved, will be the first complex of its kind in the area. The plan for the development, which is still being tweaked, will have roughly 325,000 square feet, including rooftop recreational areas. The three-building complex, on the site of a 1.95 acre abandoned parking lot, will include a high-rise tower with 175 workforce apartments, a mid-rise assisted living facility, more than 10,000 square feet of ground floor retail and a four-story, freestanding garage, which will be hidden from the street by plants. The garage, which is in the middle of the complex, will not be attached to any of the buildings, because an attached garage with functions above it would add to the cost, Frankel told the gathering. The developers of the 124th Street project are Blue Road Developers LLC and the Upper Manhattan Development Corp., both with offices in Bay Harbor Islands. They declined to give an estimate of what the development will cost, citing a variety of contingencies, including upcoming discussions with lenders and contractors as well as the city approval process itself that could change the nature of the project. The approval process for the development itself will include four steps, culminating with a hearing before the city council, Frankel told TRD. If approved, the 950 Northeast 124th Street project will be the first mixed-use project in the area. In fact, the site — which is considered part of downtown North Miamiand zoned commercial even though it is a block from 125th Street, the main thoroughfare in the area — will be part of a neighborhood redevelopment overlay district, the boundaries of which were recently expanded to include the property. The inclusion allows for residential development on an otherwise commercial site. The project’s architecture is described by Frankel as “contemporary sub-tropical” and will include large, pedestrian-friendly landscaped promenades and plazas on all public streets fronting the development. The landscaping will feature indigenous plants, emphasizing its South Florida cachet. The development may feature a number of green technologies, including energy-saving air-conditioning systems, Frankel said. Plus, the developers and architect are exploring the use of solar and wind turbine devices to generate power. In addition, some exterior shading devices, such as landscaping and green screens will be a part of the development, as will green roofs. The project, which is about two blocks east of the Museum of Modern Art, will pay homage to museum by including murals on the facades of the building on the three public street sides. This part of the development will likely be under the direction of MOCA. Frankel believes that his project will spearhead a revival of the neighborhood. “It will be a new model for mixed-use development” and for urban revitalization in the city’s downtown district, he told TRD.